Infinity Community Solutions Ltd was established in 2017 by two experienced, highly professional and dedicated social workers who saw a unique opportunity to build a boutique secular social purpose organisation. 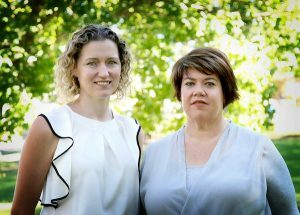 Founding D irectors, Shelley Wall and Annaley Clarke, have 40 years of combined experience in frontline, management, executive leadership, and special project roles, within the non-government community and family services sector in Queensland. Their collective commitment to this sector and the breadth of their experience has led to the establishment of partnerships at state, national, and international levels. Both Shelley and Annaley bring a wealth of strategic leadership, growth and advancement, operational sustainability, frontline service delivery, and have shaped practice models and practitioner excellence. Their commitment to advancing both their own capability, and the practitioners who work with them, has led to many innovations that have resulted in identifiable and measurable outcomes. Many practitioners, funding bodies and community-based organisations have chosen to work with Shelley and Annaley because of their capability, experience, and their leadership character. They are renown for their innovative evidence-based practice models and sector-wide capacity building. Shelley was a founding member of the National Therapeutic Residential Care Alliance. She has served in a number of governance roles with PeakCare Qld Inc. as board member, treasurer and completed a 3 year term as President in 2017. Annaley has served as a Sanctuary Australian Faculty Member since 2016. They are regular speakers at both national and international levels presenting conference papers arising from their strong value around research, leading edge practice and model advancement. Their outstanding work and accomplishments have been recognised through awards from Foster Care Queensland, The Department of Child Safety, the Sanctuary Institute, European Scientific Association of Residential and Family Care (EUSARF) and the Australia Day Queensland Committee. Infinity Community Solutions Ltd specialises in delivering high-quality solutions which are leading edge, uncomplicated, personalised, and entirely focused on the client.